Should I Build My Own Real Estate Website? It is totally possible to build your own real estate website. Many real estate agents have made very nice and effective websites that have become and integral part of their business. Websites in the real estate business are extremely important. Real estate sales has evolved in the past 10 years thanks to the internet and ease of having a personal website. This brings new and more effective inbound and outbound marketing strategies. The best part is that not every agent in your area is taking advantage of these “new” resources and strategies. Imploring them for your personal business will allow you to stand out from your competition and generate new clients. Not only is a website proven to be more effective for businesses, but don’t you want to show potential leads and your existing clients that you aren’t stuck in the dark ages? As a real estate agent, you are essentially a business owner. A self employed business owner. How many businesses, aside from real estate, do you know that do not have a website? Very few. Every coffee shop, plumber, library, auto mechanic, and landscaper in your town has a website. What makes your real estate business so different that you don’t need a website? How much extra time do I have? How long will it take me to learn what I need to do to build a website? For example, how do I choose a service to host the website, how do I get a domain name, what is WordPress and a theme, etc.? How long will it take me to actually build the website? Will the website be valuable? For example, did I properly optimize for SEO, how do I get visitors (potential leads) to contact me, etc.? The time an you spend from the day you decide to build your own website until the day that the website is complete is money. It is the opportunity cost of not having the website live and generating leads for you. It is the opportunity cost of devoting that time building a website, rather than working with your existing leads and clients. 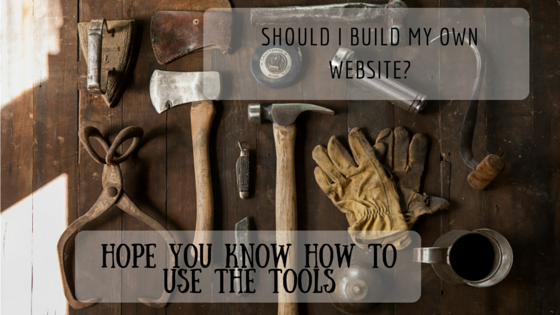 It is the actual cost of all of the tools and services necessary to actually have a website. Only you can determine what your opportunity costs are if you decide to build your own website. But I’m sure they’re pretty high. At a minimum, a you could make your own website for a cost of almost $40 per month plus at least another $30 per year. But a good website will cost you roughly $100 each month plus another $100 each year. Both options typically have a one time $99 IDX fee. Compare the cost of building your own website to the cost of a professional website developer. Is your time, your money, and your opportunity cost worth it?